On one of the islands off the West-Coast of Australia lies Lake Hillier. A bright, bubble-gum pink lake! Despite not being the only coloured lake in the world, it is unique because it is the only coloured lake where scientists have not yet determined what causes it to be such a bright pink. The lake is about 600 meters long, and is surrounded by a rim of sand and a dense woodland of paper bark and eucalyptus trees. A narrow strip of sand dunes covered by vegetation separates it to the north from the Southern Ocean. 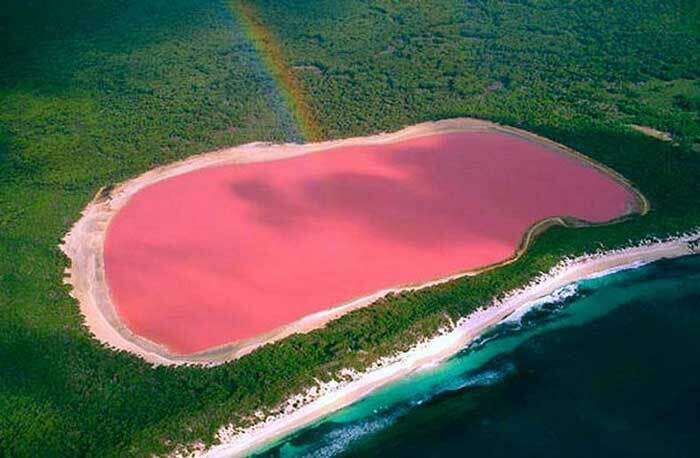 The pink colour of Lake Hillier has not been decisively proved, although it is speculated that the colour could arise from a dye created by the organisms Dunaliella salina and Halobacteria. Another hypothesis is that the pink colour is due to red halophilic bacteria in the salt crusts. That the colour is not a trick of light can be proved by taking water from the lake in a container – the pink colour can be found to be permanent.